Amsterdam: 18th O, 20h: Public discussion about the precarisation of housing in the Netherlands, the breaking down of the social housing sector, the suppression of free cultural spaces and the right to the city. Organised by the Bond Precaire Woonvormen (Union of people in a precarious housing situation) and social political centre Op de Valreep. Location: Op de Valreep, Polderweg 620, Amsterdam Oost. 19th O, 14h: Dance-demothrough Amsterdam city for preservation of social political centre Op de Valreep and for a free and social (underground) Amsterdam. Instead of placing the costs of failed financial speculation on ordinary citizens in the form of illegitimate debt and human misery, we demand that all such illegitimate debt must be cancelled. Instead of continuing the plundering of our societies for the payment of this illegitimate debt the real use-values of our houses and urban infrastructure must be given back to society. The EU market-driven policies and competition rules cannot be continued. 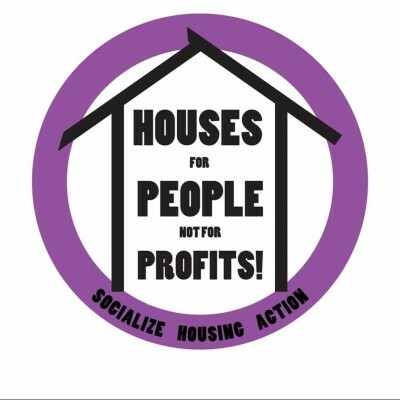 We demand legal protection against evictions and the transformation of foreclosed homes into social rental housing, affordable and secure for the inhabitants living there. land and real estate speculation has to be ended. The occupation of vacant buildings, especially speculative vacancies, has to be legalized. Public and social housing has to be constructed to decommodify real estate. This demand can be practically expressed and partly enforced by blockades of forced evictions, occupations and other creative forms of civic resistance.Let’s build an active coalition for the right to housing and the city across Europe! Let’s take back our houses, land and cities by coordinating direct action on Oct. 19 2013!